ARRRRRRGH. 4 points. We lost by 4 points. Texas Southern started 0-13, but it seemed like they played half the preseason top 25 while doing it. Their out of conference schedule was insane. Upon further research. That was a bit exaggerated, but they did play 6 RPI top 50 teams, all of which are in the tournament - Gonzaga, Kansas, Syracuse, Clemson, Ohio State, and TCU; plus a handful of other power conference teams like Baylor and Oregon. Yeah toughest nonconference schedule in the land, acc. to kenpom. Welp, I'm out in my work brackets. They pick for us and I got Iona. Oh well! Wait, what? You have a work bracket where they pick for you, and everybody gets a team, and then the person whose team wins is the winner? On the one hand that is an outrage. On the other hand, why not it could be fun. These announcers are already riding Jim Boeheim's junk and I'm going to need. them. to. stop. It will be sad when Virginia puts the tongs to UMBC and wins by 19. But right now at halftime I just want to dream. I cant believe they're up 38-24 with 16 minutes left in the second half. Is it going to happen? Is this the year?! If your excitement metric doesn't have this game at eleventy billion, it's a bad metric. Has the umbc guard that is 5’8 and 140 lbs played the entire game? I dont recall seeing him come out, and I dont have audio on. One way or another this is going to end in tears. UMBC winning screws my bracket but I am kind of hoping they win because I love an underdog. Did Jim Boeheim pay off these refs? 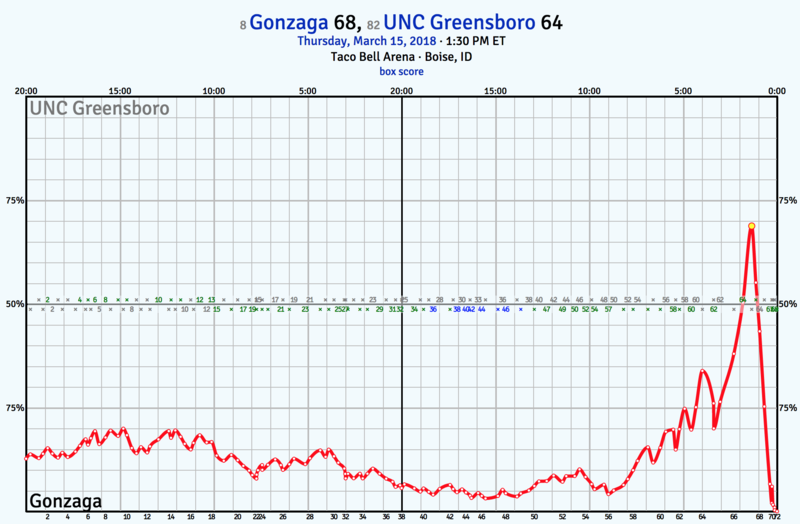 joycehealy the win % graph for UNCG's game is a tale of hope and heartbreak. 56-44 UMBC up with 4 minutes left. Virginia trapping, UMBC players cramping and tired. This is crazy. UMBC just has to win. It’ll be devastating if they cant hold on. Come on basketball gods! fleacircus, thank you for that (I had no idea there were such graphs). I mean... heck, last year we tied for the regular seasons championship, lost the conference championship, choked in the NIT. This year we rolled up the most wins in program history, schooled ETSU a couple of times, won the regular season (Jordy kissed the floor on senior night, and I about cried), nailed the conference championship (though we have gravity to thank for that Wofford win), went dancing, and held ducking ZAG to 4 points. We are going to be back, and even better, next year. Wes is building a program, and it's amazing to be here watching it happen. A 16 seed finally beat a 1 seed. Damn!! Didnt see this coming at all. I was thinking earlier today about how few stunning upsets there were so far. There's the 538 graphs, which live update. I use kenpom a lot because it is full of stat goodness, but it costs like $20/year. Don't worry about flooding a thread that's what they're for! That is not at all the 16-1 upset I picked! Watching UMBC break the press each time was like a heroic journey, watching a little 5'8" navigate around hostile giants doing everything possible, playing smart and ruthless defense (and getting away with a lot of physicality tbh...) In the second half UMBC was killing some time by being slow to inbound or slow to pick up the inbound... By the end, the Virginia players were picking up the ball and pushing it into the UMBC player's hands and shoving him back out of bounds to force them to inbound faster. Just amazing. I'm a KU fan, and every time KU gets a 1 seed I worry this will be the year. It has always felt like that was KU's special doom. And this year everyone was picking it, everyone was slavering for it. And now the doom is lifted yay. Damn it, TCU. Just damn it. I am 51. I have been watching the tournament in earnest since I was 12. I have never, ever seen anything like UMBC. I cried tears of joy first, then fear next, because my beloved K-State Wildcats face them on Sunday. I need Missouri to pick it up. What, the pieces of your bracket? I make a joke bracket every year, and pick the team closest to me to win, meaning that, for example, I have URI vs. Providence in the final game. Underdogs that bracket has correctly picked include Marshal, Butler, Syracuse, URI, Loyola Chicago, Buffalo, and finally, UMBC. It's currently only running 30 points (and 300 PPR remaining) behind my real bracket. I’ve never been so happy about my bracket being busted. I even roused mr. needled out of bed to come watch the last minutes of the UMBC game, telling him history was being made. I didn't pick them, and UVA losing has completely shredded my bracket, but the Terps couldn't even get it together enough to get invited to the dance, so gooooooooooooooooooo Retrievers!!!!!!!!!!!! I missed all the excitement last night, but I just watched that Florida vs. Texas Tech game and man to have two shots to tie it in the last ten seconds. I don't have a dog in that hunt but I was still shoutin' at my TV, y'all. Louisville (women) are shooting 70% against Marquette at the end of the first half... they are so much fun to watch. Dear ESPN: Right now, I don't care about Sam Fury's cats, WHAT IS WRONG WITH YOU. I forget whatever men's game I was just watching (it was dull) because I have tuned into the last few minutes of the Oregon women trying, for the first time ever, to beat Tennessee. They are up 54-42 with about three minutes to go. Very exciting! Much turnovers! I know I said this morning that this Chapel Hill team was overrated… But am I seeing what I’m seeing? Technically, UMBC's five points in a second-round game is an all-time record for a 16th seed. I wasn't near a TV today but I was watching scores, and what the crap... Two bizarre choke jobs by MSU and Cinci, two out-of-nowhere beatdowns of Auburn and North Carolina. This has been a really weird tournament. The increasing likelihood of a Kentucky/Duke final is depressing, though. Lose in the next round? Yes, of course, dear fan. Yep! They do a breakfast pick thing, where everyone shows up and they conference in the Dayton office and the head of HR draws the names and the teams. Doesn't cost anything but if you win you get a gift card or something. In my department, we do the same thing but on a smaller scale. So I was wrong up there when I said I was out. I managed to draw three Texas teams and two of them are still in (Texas Tech and Texas A&M). This one costs $2 per person and I can't remember if the winner gets the cash or a gift card bought with the cash. I wouldn't participate if it was done in any other way, so it's kind of fun. I just don't care about basketball to make my own brackets. It is Thursday and time for allllll the basketball to start again. The men play today and tomorrow; the women play tomorrow and Saturday. Men's side, my doctor yesterday was not feeling warm and fuzzy about her Michigan guys having to go up against Texas A&M, and I am sincerely hoping that FSU's men's team tromples Zag to bits (sorry not sorry, any Zag fans). (I still don't know who to root for in the Duke/Syracuse contest; that one is a bit of a divide by 0 thing). GO RAMBLERS!! not religious but can't help rooting for more Sister Jean! I cried tears of joy first, then fear next, because my beloved K-State Wildcats face them on Sunday. Congrats to your cats! It's amazing how they've got to the Elite 8 with hardly any minutes from Dean Wade. It is amazing. I am not psyched about taking on yet another America's favorite/Madness Cinderella but this is an incredible, improbable run. Y'all, if you're not watching Notre Dame and Oregon, y'all are missing out. This is a fast tight close game, so far, and if women were taught to dunk... these folks would be dunking it left and right. Damn. Watching the Loyola-Michigan game on TNT, which has a UMich focused broadcast with difference announcers than TBS. There's been a lot of crowd shots of UM fans,who all looked like they were at a funeral for the first 3/4 of the game. Congratulation to Layola for getting this far. I think I heard an announcer say this was only the 4th time an 11 seed made it to the Final Four. Anike with the two game winners in back to back games incredible. Here is One Shining Moment.